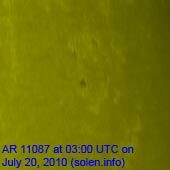 Last major update issued on July 21, 2010 at 05:00 UTC. Irregular updates are likely until August 5. The geomagnetic field was quiet on July 20. Solar wind speed ranged between 270 and 326 km/s. 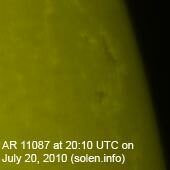 Solar flux measured at 20h UTC on 2.8 GHz was 87.0. The planetary A index was 5 (STAR Ap - based on the mean of three hour interval ap indices: 5.1). Three hour interval K indices: 21212122 (planetary), 10212121 (Boulder). 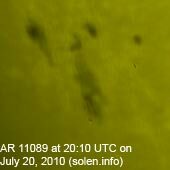 Region 11087 developed slowly and is rotating over the nortrhwest limb. Region 11089 developed fairly quickly early in the day with many new spots emerging. Later in the day several of the new spots merged into larger penumbrae. Opposite polarity separation is poor and a magnetic delta structure could easily form. The region is likely to produce C flares and has a fair chance of generating an M class flare. 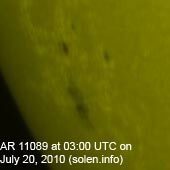 Flare: C1.4 at 13:45 UTC. July 18-20: No obviously Earth directed CMEs were seen in LASCO or STEREO images. 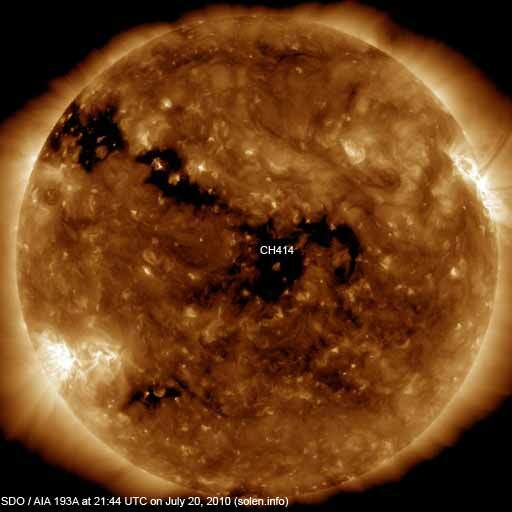 A recurrent trans equatorial coronal hole (CH414) was in an Earth facing position on July 19-21. The geomagnetic field is expected to be quiet on July 21. 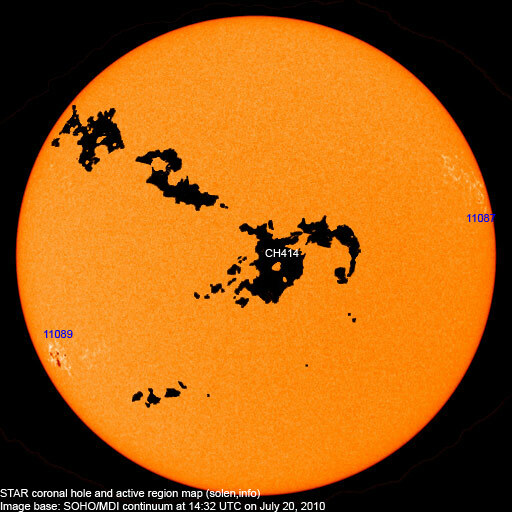 Some unsettled and active intervals are possible on July 22-25 due to effects from CH414.